Looking "where to sell my Lamborghini Miura P400?" Ask the Chicago Car Club! Are you wondering "where to sell my Lamborghini Miura P400 ?" The Chicago Car Club is interested in classic cars of all makes and models, especially a Lamborghini Miura P400. We make the process of selling your Lamborghini Miura P400 quick and painless. In just a matter of hours we will have your classic valued and, if you do so choose, turned into money in your pocket. All it takes is a phone call or electronic inquiry to get the ball rolling. 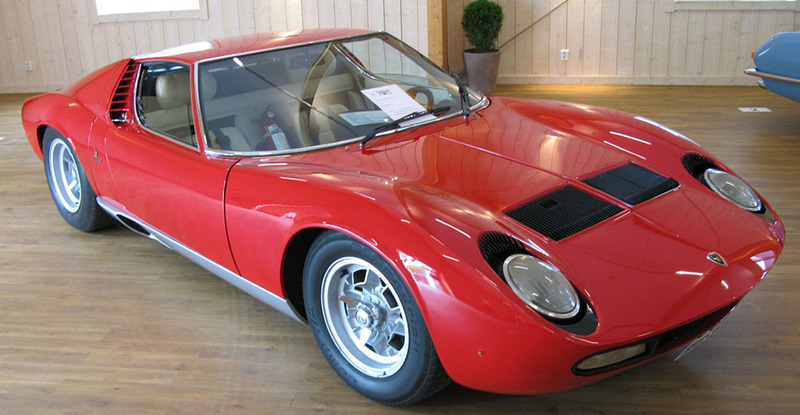 The first iteration of the Lamborghini Miura was the P400. First introduced as a rolling chassis at the 1965 Turin Auto Show, it’s transversely-mounted V12 and mid-engined layout won over spectators despite the car’s complete lack of a body. The mid-engined layout was revolutionary. The P400 was powered by a revised version of the 3.9L V12 from the Lamborghini 400GT, producing a very respectable 345hp. Lamborghini produced 275 P400s between 1966-1969, which they considered a success, as the car had a high price tag of about $20,000 ($148,000 today).